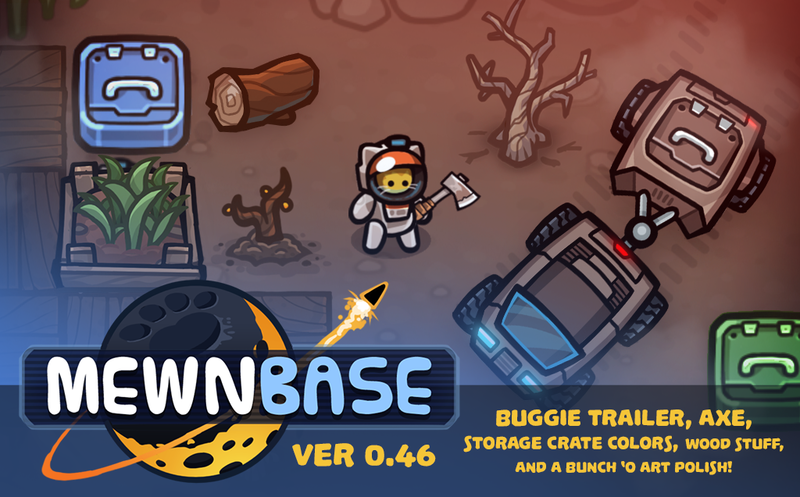 The biggest MewnBase update since 0.45! Finally managed to get this update wrapped up and out the door! There's always the temptation to just add one more thing to an update, but really... this update was already long overdue. So, what's in it? There's a new buggie Cargo Trailer. This replaces the trunk storage in the normal buggie. You can even daisy-chain them together, long as the buggie's engine can move them. New damaged buggie and broken wheel art. Made buggie a bit easier to drive by reducing the acceleration and top speed a bit. Refactored vehicle code, and laid the framework for easily adding in more wheeled vehicles in the future. Trees for the longest time were the only tile you couldn't clear away in MewnBase. No longer! Added an Axe for chopping down trees. Trees now have the chance of dropping tree seeds that you can plant anywhere in the dirt. A new Wood resource that you can use in the Biofuel Generators, or make into classy wooden floor tiles. 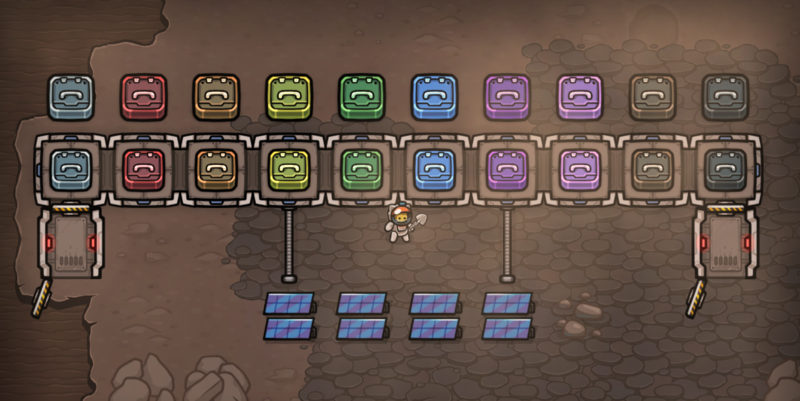 Added Garden Patch, a slower, low-tech alternative to the Greenhouse module. Tools such as the axe, shovel, and jackhammer now have durability. So they'll eventually break, and need to be re-made. Stronger tools will probably be added in a future update. Can now customize the color of your storage crates, they also have new open/close animations and sound FX. Some new main menu art. New base-stats UI for showing how much Oxygen, Power, and Water a base has. New comms-range indicator for receiving messages from nearby bases (such as air-leaks). New graphics toggles in the Options screen for V-Sync and High-Res mode. Localization updates from the MewnBase community. New player animation + sound FX when starving. New sound FX for walking on different surfaces. Bases hit by lightning lose stored power. Capped the max number of trees that spawning per chunk. Tech upgrade "Cooking" no longer requires Construction as a prerequisite. Moved most data .json and localization files to be more easily player-editable. Fixed bug causing air leaks that happen too often. Fixed a crash when cancelling items in crafting queue.